This mighty Aluminum modified Vee hulled Lund is perfect for big water without getting into a larger size vessel measuring 17'2" and a 93" beam. 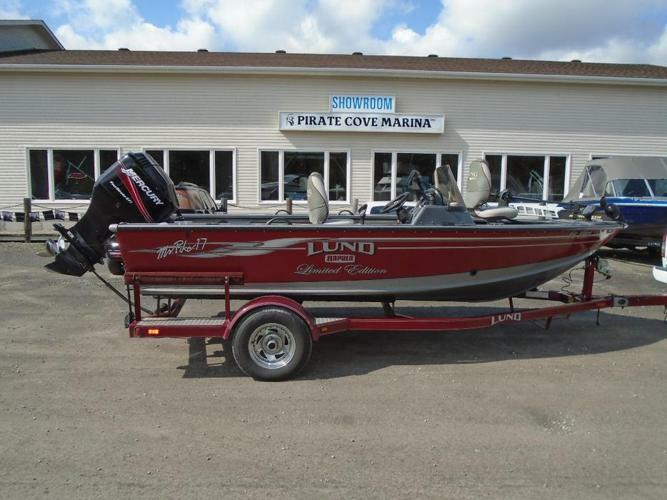 This boat is loaded with features including a Mercury 115 EFI 4 stroke, a Mercury 8 hp kicker, a Minn Koka 80lbs Fortrex trolling motor with universal sonar, thirty- two gallon built-in fuel tank, Humminbird 898 CXSI with side imaging at the console & Humminbird Matrix 27 both the GPS capability, 2 livewells with bait bucket, stereo, VHF, onboard charger, three batteries, rod storage for eight rods, downrigger mount & 2 rod holders, three seats, snap-in carpet and an EZ Loader trailer with swing tongue & load guides. At this time of the year it will go fast, don't miss out.